Using a new material can be intimidating at first. No need to worry! 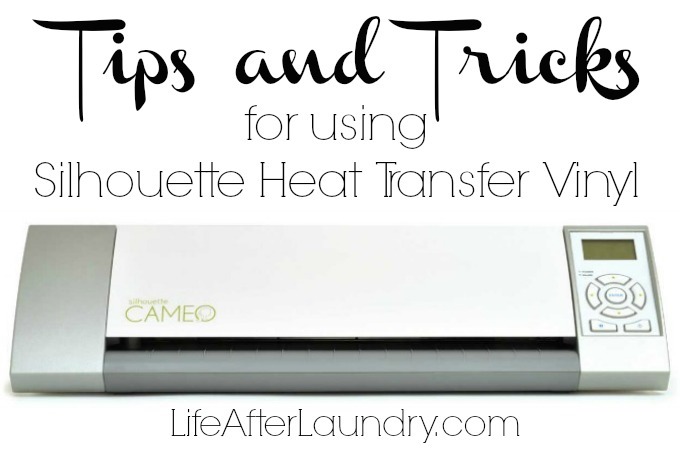 Here are a few tips and tricks for using Silhouette heat transfer vinyl to help you have the best results each time. QUALITY MATTERS via My Paper Craze. Glenna recently found out the hard way that with HTV quality does matter. She got in a pinch and had to use a different brand. It was a huge disaster! ALWAYS MIRROR your text (or image if need be) via Typically Simple. I know I have messed this up several times myself. Thankfully, I have always realized before I go to iron, but it is frustrating just the same. Especially if you are limited on supplies. TEST CUT. Any time I’m cutting something with my silhouette I make a test version in cheap cardstock. This helps me make the the size and look is how I intended. Lauren from The Thinking Closet recommends also make a test cut with the heat transfer vinyl, so you can adjust the cut settings if need be. WARM UP YOUR CLOTH. Run the iron over where you are wanting to put your design. ALWAYS USE A PRESSING CLOTH. This is stated in the instruction, but I wanted to make sure I mentioned it anyway. In another tip below you will find out what awful thing happened to me when the iron came in contact with the heat transfer vinyl and there was nothing in between. PRESSURE, PRESSURE and more PRESSURE via Stephanie W. I think pressure is just as important as your heat. If the vinyl isn’t coming in contact with your fabric enough it can’t bond with the material. WATCH YOUR HEAT AND CHECK YOUR DESIGN AFTER 30 SECONDS via Feto Soap. The cotton setting may be too hot on some irons, so it is probably a good idea to do a test run with your iron before working on the final design. She also recommend checking it after 30 seconds. Both of these will vary if you are using a different kind of vinyl. REMOVE THE CLEAR SHEET SLOWLY. It is very likely that part of your design didn’t adhere the first time. Removing the sheet to quickly could tear your design if this is the case. Going slow gives you the opportunity to fix this by going back and adding more pressure and heat. IF YOU TEAR OR MESS UP PART OF YOUR DESIGN, cut the same shape and apply it over the messed up shape. This recently happened to me with my mustache Christmas tree sweater. I was ironing on one mustache when the iron accidently hit one of the completely mustaches, melting that spot. After a moment of panic I decided to cut that exact shape and apply it over the original. Much to my delight it worked perfectly! IRON THE BACK via The Thinking Closet. Be sure to turn your garment inside out and press the back-side, as well. PRESS AGAIN. If you wash your design only to find a few corners still hasn’t quite adhered, don’t worry, just apply a little more heat with your iron and pressing cloth. Sometimes a picture is worth a thousand words. My friend Lauren over at The Thinking Closet has more tips and wonderful picture examples. Check out a few of my heat transfer vinyl projects! Do you have any tips for using heat transfer vinyl? Thanks for the link-love, friend! You’ve rounded up some fantastic tips here. Great reminders for me as I tackle another HTV project this weekend. Just can’t get enough! Thanks for the link Brenna! Great tips for someone just starting out with HTV. I hate to have to learn everything the hard way! Thanks so much for the tips Brenna. I have still yet to tackle htv. With the tips maybe I’ll give it a shot this weekend. I have some from Silhouette and some onsies. Warming up the cloth before applying the vinyl is a smart tip, I feel like that would help it transfer more easily. Thanks for sharing the tips!